American ginseng, scientific name Panax quinquefolius, is a close relative of Korean ginseng (Panax ginseng), and belongs to the Araliaceae family, which is the same as Siberian ginseng (Eleutherococcus senticosus). It is a perennial herb, distinguished by its dark green leaves and clusters of red berries, that grows wild in eastern North America. The root of the plant is used medicinally, particularly in China, where traditional Chinese medicine places a high value on it. American ginseng was used medicinally by many Native American tribes as a health stimulant and sexual tonic and for various health problems including headaches, female infertility, digestive problems, fever, and earache. American ginseng was introduced by Native Americans to European settlers in North America in the early 1700s. A French Jesuit priest named Jartoux had traveled through China and was convinced of the medicinal powers of Korean ginseng. In 1714, he published a paper in Britain about Korean ginseng and its healing powers, and theorized that the plant may grow wild in the favorable climate of North America. Another Jesuit missionary in Canada, Joseph Lafitau (1681-1746), read the article and began searching the woods near his dwelling. Lafitau found American ginseng plants, which bear a close resemblance to their Asian cousins, and sent samples of them to China. 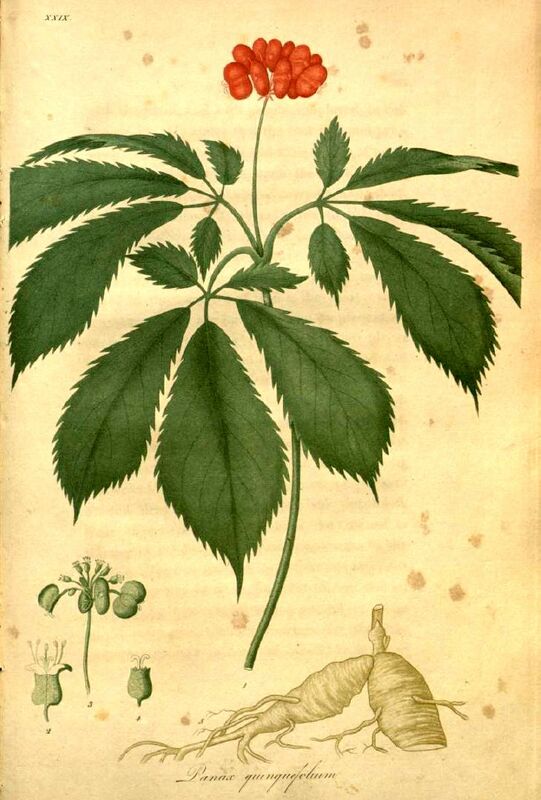 A thriving trade of American ginseng began around 1718, it was sent to the Orient, gathered by Native Americans, French fur traders, and early frontiersmen including Daniel Boone. American ginseng grows wild in the forests of the eastern United States and southeastern Canada. It grows in shady, moist and hilly regions, but the plant is becoming increasingly scarce due to over-harvesting and logging practices. In Kentucky, Tennessee, Virginia, and Illinois, American ginseng holds status as a threatened or an endangered species. Some botanists believe that pollution and a thinning ozone layer are contributing to its decline. Efforts at protecting wild American ginseng have not been successful, as the demand for it in the Far East makes it a lucrative crop for poachers. It sometimes sells for as much as $600-800 per pound. The majority of American ginseng on the market is now cultivated, although it is a sensitive plant and difficult to farm. In the United States,Wisconsin grows 80% of the American ginseng crop. Canada grows more American ginseng than any country, and is second only to China in total ginseng production. The majority of research performed on ginseng has been done on the Korean and Siberian varieties. Clinical and chemical research on American ginseng is yet to be done. One reason for this is the American medical establishment’s skepticism of herbal remedies. American ginseng is classified as an adaptogen, which is a substance that helps the body adapt to stress and improves immune response. Adaptogens must also be non-toxic and cause no major physiological changes or side effects. American ginseng root has an array of complex chemicals, and scientists have determined that the active ingredients are saponin triterpenoid glycosides, or chemicals commonly called ginsenocides. American ginseng contains nearly 30 ginsenocides. However, American ginseng has been found to contain higher levels of ginsenocide Rb1, which has a sedative effect on the central nervous system, than other species of ginseng. Thus, scientific research has been consistent with Chinese herbalists’ claims that American ginseng is less stimulating than Korean ginseng. The research implies that American ginseng can provide the strengthening and immuneenhancing effects of other ginseng without overstimulation to those people with high levels of stress and mental stimulation. American ginseng may be the best ginseng for Americans, whose fast-paced and energetic lifestyles may call for more calming and balancing herbs. American ginseng can be used by those people who seek the adaptogenic effects (toning, strengthening, and immune enhancing effects) of Panax ginseng without the highly stimulating aspects. Chinese herbalists consider American ginseng to be a cooling herb, so it can be used as a tonic and immune strengthener for people who are over-stressed or suffer from hot conditions like high blood pressure, excess nervous energy, or ulcers. American ginseng, according to Chinese herbalists, is more suitable and balancing for women and children than Panax ginseng, and is more applicable for the elderly who wish to avoid stimulants. American ginseng is also used in Chinese medicine for chronic fevers; to aid in the recovery of infectious diseases; for strengthening the lungs in cases of tuberculosis, bronchitis and asthma; and for the loss of the voice associated with respiratory disorders. American ginseng can be purchased as whole roots, powder, capsules, or a liquid tincture. For whole roots, wild ginseng is the highest quality and also the most expensive. Also available are organically grown cultivated roots, which are free from pesticides and chemicals. The easiest way to prepare ginseng roots is to make a tea from them. Ginseng roots are very hard and brittle. They should be sliced and simmered in water for 45 minutes or longer to extract the majority of ginsenocides. Experts recommend avoiding metal pots, which can reduce its antioxidant properties. Some herbalists recommend boiling ginger or licorice root with American ginseng to increase its effectiveness. For each serving of tea, two or more teaspoons of ginseng root are recommended. Pregnant women should use American ginseng only under a doctor’s orders and avoid any products that contain Panax ginseng. Consumers should assure that the American ginseng product they purchase is a reputable one. Because of the high price and demand of American ginseng, some questionable products are on the market. Generally, wild American ginseng is of higher quality than the cultivated plant, and the older and larger the root, the higher the quantity of ginsenocides present. In addition, consumers should be careful not to confuse American ginseng with Panax ginseng, which has been shown to produce more serious adverse side effects. A 2002 report stated that the effects of Panax ginseng seemed more likely when the herb was used in combination with other products than when it was used alone. 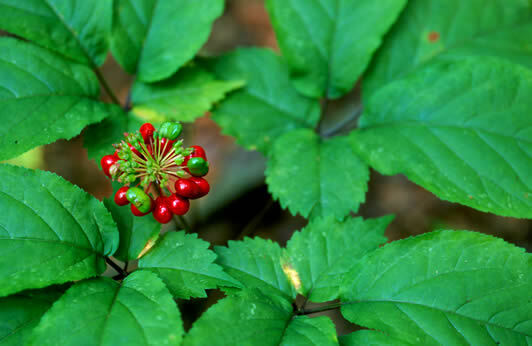 In general, American ginseng is gentle and side effects are rare. Side effects may occur with American ginseng when taken in the wrong dosages, over too long a time, or by people whose constitutions, allergies, or health conditions disagree with the herb. Also, products combining Korean ginseng with American ginseng may increase the chances for side effects.